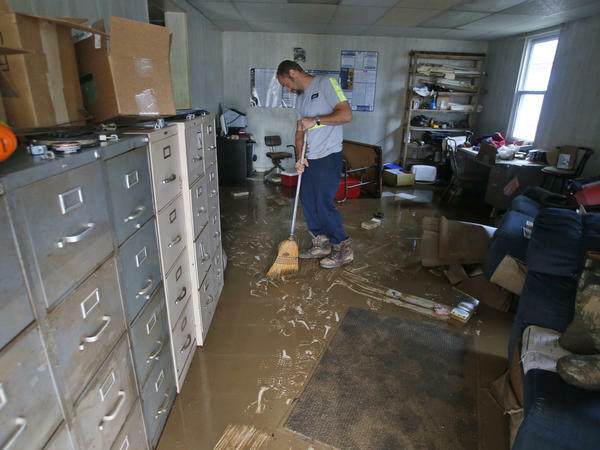 Shane Altzier sweeps out the mud from the utilities office in Rainelle, W.Va., one of the towns hardest hit by floods that tore through the state on Friday. More rain this week has slowed cleanup efforts. Days after deadly floods swept through West Virginia, everything in the front yard of a home in Rainelle is still caked in mud. As the water recedes in West Virginia, residents are taking stock of their losses. At least 23 people died in massive floods that swept across the southeastern part of the state on Friday. According to state authorities, the water damaged or destroyed more than 1,200 homes, and thousands of people who lost power are just getting it back. President Obama has declared three counties — Kanawha, Nicholas and Greenbrier — disaster areas, which gives residents there access to emergency funds for housing and medical care. On Tuesday, Gov. Earl Ray Tomblin requested a federal major disaster declaration for an additional seven counties in the central part of the state. 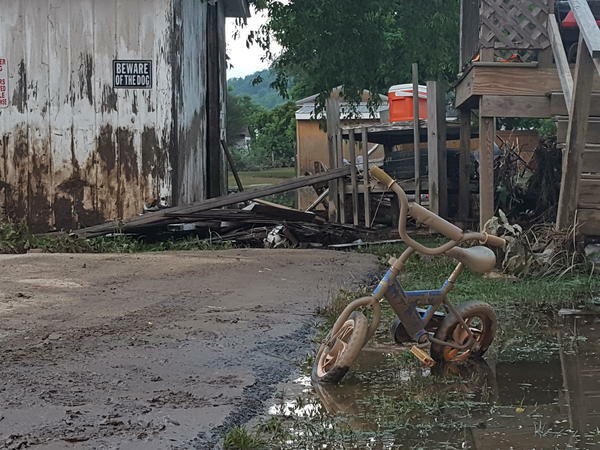 In a statement, Tomblin said, "As cleanup continues in so many communities across West Virginia, we are seeing the overwhelming damage that has been left behind." The Federal Emergency Management Agency is already on the ground in the three disaster-designated counties, surveying the damage and meeting with individuals whose homes and businesses were damaged or destroyed. One of the hardest-hit towns is Rainelle in Greenbrier County. All of the downtown area next to the Meadow River was washed away. Linda Rhodes has lived there for 55 years. Driving down Main Street, she says she doesn't know how the town will rebuild. "There aren't any jobs here. None at all," she says. "Now, everything's gone. God help us." The mayor of Rainelle, Andy Pendleton, is hoping the federal government will help. Pendleton says she met Monday with FEMA representatives, and says that all this week she and other local leaders will hand out packets to residents, explaining how to apply for federal money to rebuild homes and businesses and to replace cars and other personal items that were destroyed. "I worry the most about the people who don't have anything to go back to," she says. "All those people who lost their homes, who lost people in their families in the flood. They need help." At least a dozen people in Greenbrier County died, according to the West Virginia medical examiner. The National Guard helped with the search and rescue operation and continued to be on call as more rain fell on areas where the soil was already saturated, prompting the National Weather Service to issue flash flood warnings. Some areas where water had receded were flooded anew, but no further fatalities were reported, according to the state police. The National Guard says it expects to be on the ground at least until the end of the week, removing debris and assisting the local and state police in cleanup efforts.